If you have another email address you can use, at least temporarily, please change your YogaTrail email address in the "Account Settings". You'll find it in the top right header when you're logged in. Go back to the page where you enable payments by connecting to Stripe. With the new email address, you should be able to connect. You'll be creating another new Stripe account, and this is actually preferred, because then any revenue coming in from YogaTrail will have it's own report, and things will be much easier for you to manage on Stripe. Stripe lets you easily integrate 2 different accounts onto the same Stripe dashboard. You just need to log into your first existing Stripe account, and then click this link: https://dashboard.stripe.com/account/team. 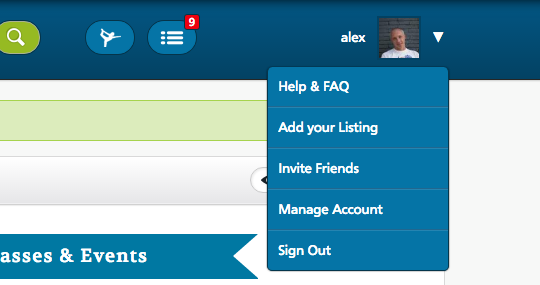 Once you're there, click the button 'invite user' at the bottom right of the window and enter the email address of your second Stripe account (the new YogaTrail one). You'll then receive an email to confirm this (from Stripe). Once you accept, you'll be able to easily switch between accounts using the top right menu in Stripe. Finally, after connecting with Stripe, you can change your email address on YogaTrail back to your original one, if that's the one you prefer. This may seem a bit convoluted, but it really takes just a few minutes to set up. If you still have trouble connecting to Stripe, please contact us here with detailed description of your trouble.